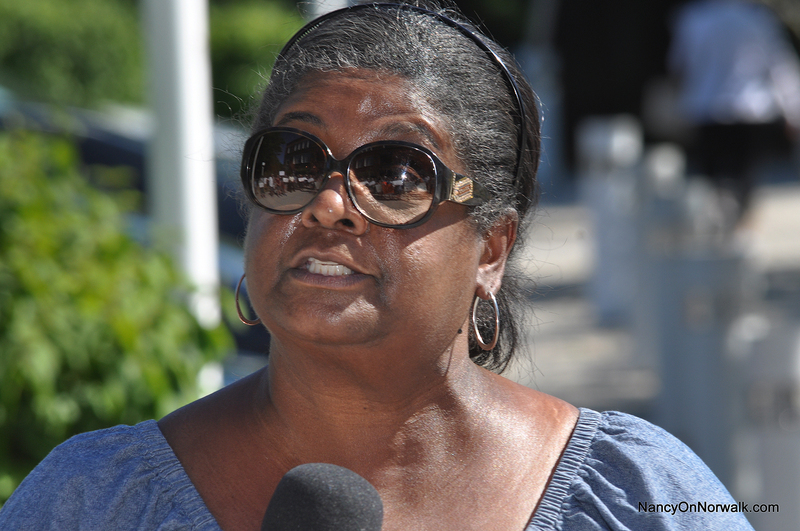 Norwalk Branch NAACP President Brenda Penn-Williams speaks at last week’s rally at City Hall. School Budget – WAKE UP NORWALK!!! We have major concerns about how the Norwalk Schools are being run. There Is evidence of gross fiscal irresponsibility on the part of Superintendent, Dr. Steven Adamowski and his cabinet. We are publicly calling for action from the Board of Education and demand that Dr. Adamowski and his cabinet immediately step down. Central Office administration has no cuts. They are only cutting two secretarial positions. School districts that surround Norwalk are opening alternative schools while we close. – The head of Partnerships and Technology now has a director under him. – Adamowski is moving the principal at Brookside – She will be .8 at Brookside and .2 at Central Office. – A Norwalk High School Housemaster is working 2 days at CO. Now they are cutting one assistant principal at Norwalk High School. Look at the moral character of a man in a power position over people and policies. Alleged sexual harassment is not acceptable. This person makes decision about sexual harassment in the schools affecting our children. Google the districts where Adamowski was and you can see a trail of failing schools, financial struggles and the same failing programs he is putting in Norwalk. Hartford, Wyndham, New London and Cincinnati. They are still trying to recover. Cutting Central office administration would save a tremendous amount of money-almost equal to the deficit and not affect students or schools if they cut the administration on the 3rd floor. It is time for Adamowski and his team to leave Norwalk NOW! His immediate departure is what is best for all Norwalk kids!!! Board of Education members declined to comment. Adamowski said he’d need time to study the statement. Under NAACP bylaws, the NAACP president is the only person authorized to speak on behalf of the branch. The 2018-19 budget passed unanimously by the Board on Tuesday calls for the elimination of two unspecified Central Office positions. NPS is “moving people around like puzzle pieces,” Norwalk Association of School Administrators (NASA) Vice President Tony Ditrio said at last week’s rally in support of West Rocks Middle School Principal Lynne Moore. The Pathways Academy at Briggs is being eliminated in the 2018-19 budget, and will be replaced by two blended learning classrooms at each high school, Hamilton said last week. NPS Chief of School Operations Frank Costanzo has been accused of making sexual advances on an employee when he was principal of the Cooperative Arts and Humanities High School in New Haven, before he came to Norwalk in 2015 to serve as NPS Chief Operating Officer. Costanzo and the New Haven Board of Education are being sued in federal court by the employee, Chanel Rice, for “unlawful and retaliatory conduct.” A settlement hearing is scheduled for July 12. “All across the country there is sexual harassment going on. How come we have not done anything about sexual harassment being here at the Board of Ed?” Penn-Williams said at last week’s rally. In October, the Board of Education voted 5-4 to authorize salary increases for seven NPS administrators. Three of the four Board members who voted against the increases are no longer on the Board, by choice: Yvel Crevecoeur, Sherelle Harris, and Artie Kassimis. Shirley Mosby failed to win reelection. The raises represented a $65,000 increase in the budget, with Finance Committee Chairman Bryan Meek in October calling the move an adjustment to reflect market realities. In 2013, Norwalk Public Schools Chief Operating Officer Elio Longo resigned and took a position with higher pay with Westport Public Schools. In 2015, Chief Financial Officer Rich Rudl resigned for a position with higher pay with Wilton Public Schools. Hamilton received a 3.5 percent raise, to $185,653. The range for the Chief Talent Officer was made $172,000 to $195,000 and the range for the Chief Communications Officer was increased to $112,000 to 139,000. “This is an attempt to bring the same kind of order to the way the salaries are set for these positions as we have for all the other positions in the school system,” Mike Lyons said in October. The 2017-18 budget added a communications executive secretary and a part-time communications writer. At Tuesday’s BoE meeting, interim Chief Academic Officer Craig Creller said that the June 18 SBAC (Smarter Balanced Assessment Consortium) results show Norwalk has increased its math scores in 2017-18. Geez, we could put a longer list of failures about rilling. Maybe start with him and kick him out of office first. And since when is $65,000 a 10% increase of the cabinet’s pay??? Someone needs a math lesson! The Zen-Master would say – if a tree falls in the woods, and no one is there to hear it – did it really fall? Point is – Ms. Penn-Williams has had a hissy – does anyone care? Check the documents for the obvious fingerprints of the disgruntled Lynne Moore and Tony Ditrio. Sabía la Sra. Penn-Williams que el grupo demográfico minoritario más grande en Norwalk es hispano? In other breaking news – the seagulls at Calf-Pasture are complaining that the residual spoils of Ripka’s lunch-baskets have been inadequate this year – and a handful of “gray” squirrels have been getting more than their fair share. What about that! I find it highly amusing that calling for the resignation of one of the most successful Superintendent’s we have ever actually pretty amusing. The schools have been flourishing, more kids graduating the acheivment gap has been closed and many many more positive things happening. But YES lets call for his resignation…Are you kidding me Brenda?!?!? I think if anyone should be resigning here is Brenda Williams! But let me ask you this Brenda, Is this really where you should be focusing your anger and rage!??! I would think not, call me crazy that Our Wonderful State Majority Senator Bob Duff who is Dan Malloy’s Boy would be a more appropriate ya think?!?! After all he sits up in Hartford where ECS Funding comes out of for the last how many years and watches Norwalk get SCREWED!!! & SCREWED again to the tune of $20 Million Dollars!!! If your going to call for anyone resignation it would be Bob & Co. But I urge you to hang on a little while longer as come November Bob and friends will be out of a job and we will begin to save our State and more money will flow to Norwalk. And we won’t have to wait 10 years for the change. The poop rolls down hill and it starts right at the Gold Dome. And next session when I go up with our New Senator from Norwalk to testify to the Education Committee I will save you a seat right next to me. Attacking the Supt. and the BOE gets some attention. But doesn’t move the needle. Looks like the days of real political power in SoNo’s seat of political power in our Democrat party have moved on. With the new SCOTUS decision on union dues, Tony may be out of a job soon. Great news! I’m in. Norwalk a bit over 3 years and connect with parents often in various environments throughout the city … and this is all true. She left out the sped chief , Yvette’s federal indictment & that it’s still open .. you can internet search it & see fir yourself. Geez…. I can’t believe that Brenda is playing puppet again. I’d be curious to know if Tony Ditrio and Lynne Moore had anything to do with putting Brenda and the NAACP up to this. That’s definitely worth noting in this story. I am curious as to the author of the information she is presenting. I think thats worthy of a story in itself. @Nancy? Brenda is right. He’s doing to Norwalk what he has done to other districts. Just google him. I agree that Brenda is right. (1) If Central Office administrators were cut, they would know by now. Who are they? Or are they really only secretaries when schools are losing major people who have direct contact with students! (2) Have the scores for the June,2018 tests been released? How come they are not posted? If they are, where? If they are, what about every other score? Only math went up? Please enlighten us, Craig. (3) no, $65,000 is not a 10% increase in salary, but it’s certainly not a 2% increase either. Do the Math! (4) How is it that central office gets huge pay raises when student aides are being cut? How can this be justified? How can the large increase in central office personnel be justified? I believe that when Adamowski leaves, Norwalk will suffer for a long time to come! John S, I was thinking the same thing! Brenda Penn-Williams is putting up a stink … It is about time someone holds Lynne Moore accountable for her actions! And I did google Dr. Adamowski. I read nothing but praise!! And how about this one? The most recent! Thank you, Dr. Adamowski, for your work! Edited to remove an instance of ascribing motives without proof, a violation of the comments policy. Can we all just blame Poko? No Sid Norwalk is a Democratic tragedy. With that said they do fight among themselves and have many issues that generate nothing but conflict.Notice the people who run the city have never been elected. Taxpayers need to take back the city no matter what party is scamming us. The board was elected by citizens who approved of what they were doing. If they don’t approve, they will be voted out. If they are satisfied, they will be re-elected. That is how the process works. They is who they answer to. I’d blame it all on his White Priviledge. Rivera wasn’t as fortunate. The issue with ECS currently lies in the States Education Committee. Until we can get someone from Norwalk on this committee we will never get a significant increase. Currently, this committee is chaired by State Rep Andy Fleischman of Hartford. It’s interesting that Hartford received an additional $3 million for the F19 budget. Coincidence? Of course not! So the reality of people hammering Bob Duff on ECS or new candidates saying they’ll be able to get more funds is false, pure politics. Unless they have clout within the committee itself that hands out the ECS funding, Norwalk will not see more than peanuts for an increase. Lawsuits, bus trips, letter writing will all fall on deaf ears. Norwalk needs to get a hold of the committee that allocates these funds. – infrastructure costs for other land use transactions from Washington Village to Glover Ave to POKO, etc. Why do you think the grand list doesn’t grow, despite all the development and your property taxes go up? It is a one-way street with Hartford and Norwalk has no executive leadership defending her! Ms. Brinton ignores the fundamental reason why Norwalk is failing. And its not related to Hartford. Our City spends too much. What’s the evidence. Our Supt. say we maintain “competitive salaries” with the surrounding wealthy towns where incomes are 4 to 5 times higher. City Hall Administrators are paid well above what they’d earn in the private sector. Even our Mayor is paid the same as CT’s Governor with vastly superior responsibilities. Few City Union workers live here citing high property taxes. Long stagnant Grand list, falling property values, exodus of of long time residents and reluctance of new business to locate in Norwalk all give evidence of City overspending. Any college freshman business or economics or finance student could easily explain how excessive spending creates a failing City. As long as we continue to elect City officials without major business experience we know our future. And no one in tune with City politics believes our situation will change. Our political Paraties have never offered a Mayoral candidate with senior business experience. And even the Tooth Fairy believes that will never change in Norwalk. So not many of us will retire here in the well known “hole in the middle of the donut”. Blaming Hartford for Norwalk’s troubles is just plain “silly”. To be polite. If we really want to do better we need elect City officials, especially in the Council, who are qualified to run a small Wal Mart. And have some serious business and management experience. Best I can recall no elected official in the City’s modern history has been qualified by prior experience to oversee a City with a $400 million budget. So we get what we deserve.